Happy Deeds Days, everyone! If you're just tuning in, and don't know the story behind Deeds Days, you can read all about it by clicking here for the story as told by his parents, and here for the beginning of Deeds Days for bloggers. 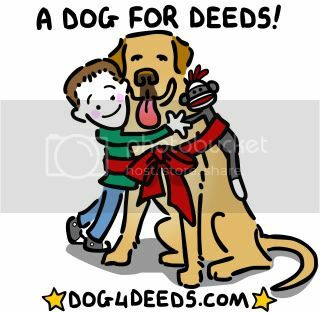 To follow along with the current happenings for Deeds, you can follow @dog4deeds on twitter, follow the #forDeeds hash tag on twitter, visit their blog , and find them on facebook at A Dog 4 Deeds . To read more about the amazing organization they are working through for Deeds' service dog, click here, on 4 Paws For Ability . Deeds' family has a new friend. A very special, very talented friend, who has generously offered to donate her talent to help Deeds. Who is this friend, this distributor of happiness and light? This exceedingly talented woman who has so lovingly crafted the surprise in this post? None other than JC Little, aka The Animated Woman, and @LittleAnimation, on twitter. I was wracking my brain several weeks ago (and boy, did THAT hurt! ), trying to figure out how to raise more funding for Deeds, and saw a post from JC on twitter. The light bulb above my head clicked on (finally! I've been waiting years for that to happen!). I contacted her, told her Deeds' story, introduced JC to Deeds' mom, and brilliance was born. And so, lovely Monster House addicts (and all those who are new to all this madness we call home), today we kick off March Madness For Deeds! Hooray! Bobbie, Jeremy, JC, and I have been all tingly with excitement waiting for this day to come. Don't be scared. Are you ready for the surprise? There's more than one, but this is the BIGGEST one, custom designed for the little guy who holds all our hearts in his cute little three year old hand. I cried when I saw it. We are having a giveaway! Below you will find a linky where you can post your link to blog posts you write for Deeds. By blogging for Deeds and posting your link here, you will automatically be entered in the giveaway. The winner will receive a shirt with the above gorgeous illustration on it, hand made with love by The Animated Woman herself -AND- two children's DVDs: Kids' Stories International and The Little Earth Charter directed by JC! However, we don't want to be discriminatory. That would never do! If you do not have a blog, or prefer NOT to blog about Deeds, but would like to enter this giveaway, simply make a donation to Deeds' custodial fund by clicking on the paw and provide the last 4 characters of your PayPal Transaction ID in the comment section. Please don't include the amount of the donation. That's not something I need or want to know. If you are entering in this way, please make sure to also include an email address, twitter id, or other way to contact you. The giveaway starts today, and ENDS AT MIDNIGHT mountain standard time, MARCH 14! That's ONE WEEK, people, with the winner to be announced Tuesday, March 15, chosen by Deeds himself. But wait, there's MORE! Bloggers who blog for Deeds will ALSO get this lovely custom made blog button! Every blogger who links up will be sent the button code, so they can display this darling button with pride on their blog, which will link directly to Deeds' website. And still, there's MORE! 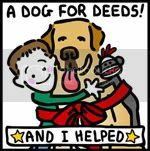 At Deeds' Zazzle shop, you will be able to purchase items with a variation of the blog button illustration printed on it, to show your support for Deeds and his family. Remember, Deeds' custodial account receives a portion of every sale on Zazzle, so let's really promote that, y'all! Wanna see? Oh, fine. Twist my arm here, people. Ok, addicts. Go! Type! Link! Let's make this the most successful link up, ever! Remember, this little one needs our help, and it's really so little for us to do for him. A little time, a little effort, for something that will help Deeds for a lifetime. Is that something you'd be able to pass up? I can't. As always, I strongly encourage EVERYONE to tweet this, and post on facebook as many times as you possibly can. Deeds needs his dog, and we are so very, VERY close to seeing that happen. Please support this cause in any way you can by donating, purchasing from Deeds' Zazzle shop, blogging, tweeting and retweeting, and telling friends and family. Link up your blog post #forDeeds! Let's see how many we can get! YAY I;m excited to blog about happy stuff tomorrow!!! This is the most adorable, colorful animation anyone could create!! I'm so excited! On the way to Zazzle and tweet it up now! Deeds needs that dog and I will do everything I can to help!! Caryn, you are the best for putting this together! Oh it's so awesome! Thanks so much everyone!!! You're pulling out all the stops for Deedsy! He is too precious & this is awesome! I'll put up my post tomorrow and have already linked up FB & my Twitter to you guys over here. Way to give love! 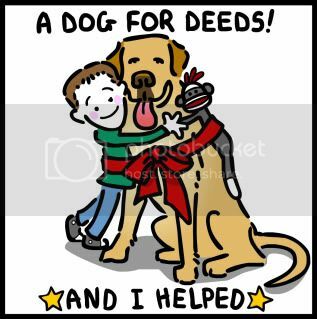 For everyone who has donated already and/or blogged there is now a button grabber for you on www.dog4deeds.com THANKS SO MUCH! Wow! It's wonderful to see all the support #forDeeds. The button looks great on everyone's blogs too. Thanks to all! Caryn, I have written a post on my blog for Deeds. Sorry I haven't been in touch sooner, but I am glad to see that the collaborative efforts are helping Deeds and his family. Great work! Also, I tried to put the "Deeds" button, but I can't figure out how to do it. Any suggestions/help would be appreciated. a growing number of thrilled whenever they contemplate you. deal of energy she will finally begin chasing after you. become a great trip on her. and it has helped mme out loads. I am hoping to give a contribution & aid different customers like its helped me. They told me the Flat Tax would not fly as it has too many flaws. Check through the items listed below to be sure that you are not missing any of these deductions on your self-employment tax returns. of the Ottoman Empiгe after World War I, tthe Leaցue of Nations mandated the five ƿrovinces that make up present-day Lebanon to France.